Toby Fleishman thought he knew what to expect when he and his wife of almost fifteen years separated: weekends and every other holiday with the kids, some residual bitterness, the occasional moment of tension in their co-parenting negotiations. He could not have predicted that one day, in the middle of his summer of sexual emancipation, Rachel would just drop their two children off at his place and simply not return. He had been working so hard to find equilibrium in his single life. The winds of his optimism, long dormant, had finally begun to pick up. Now this. As Toby tries to figure out where Rachel went, all while juggling his patients at the hospital, his never-ending parental duties, and his new app-assisted sexual popularity, his tidy narrative of the spurned husband with the too-ambitious wife is his sole consolation. But if Toby ever wants to truly understand what happened to Rachel and what happened to his marriage, he is going to have to consider that he might not have seen things all that clearly in the first place. 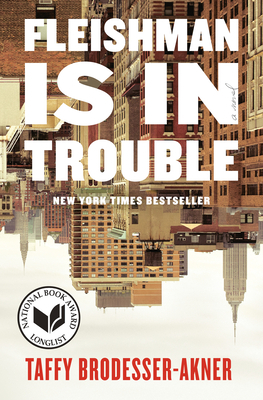 A searing, utterly unvarnished debut, Fleishman Is in Trouble is an insightful, unsettling, often hilarious exploration of a culture trying to navigate the fault lines of an institution that has proven to be worthy of our great wariness and our great hope. Taffy Brodesser-Akner is a staff writer for The New York Times Magazine. She has also written for GQ, ESPN the Magazine, and many other publications. Fleishman Is in Trouble is her first novel.